The 1st floor deals in hosiery and socks, the 2nd floor for Daily Necessities, gloves, hats and other needle cotton fabrics, footwear, Shoes, wool, towels, lace,neckties on the 3rd floor, bra underwear, scarves andbelts, straps on the 4th floor. It provides a full range of services including modern logistics, E-business, international trade, financial services, accommodation, etc. 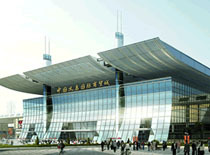 The market was equipped with 4D Motion Cinema, tourism shopping and other special commercial services.